Hmm. Always be able to stop in the distance you can see to be clear! 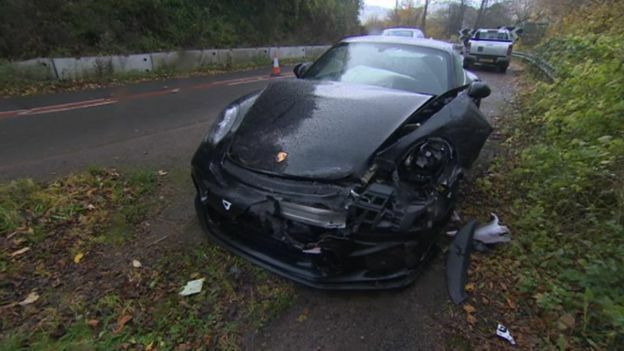 Posted: Mon Nov 12, 2018 8:03 pm Post subject: Chris Harris crashes his 991 GT3 Touring ! Ouch !! Shame to see that, seems a top bloke. Posted: Mon Nov 12, 2018 8:46 pm Post subject: Re: Chris Harris crashes his 991 GT3 Touring ! Ouch !! Was he not being careful then? Posted: Tue Nov 13, 2018 12:49 am Post subject: Re: Chris Harris crashes his 991 GT3 Touring ! Ouch !! There is the worlds cheapest 911 GT3 Touring, right there.............so far anyway. Posted: Tue Nov 13, 2018 6:38 am Post subject: Re: Chris Harris crashes his 991 GT3 Touring ! Ouch !! Someone who doesn’t understand road markings by the look of the solid white lines and chevrons in the photo .....! Good that no personal injuries though ...! Cat D GT3 touring anyone..? Police confirmed speed not a factor. Post above infers the truck driver has been issued with a penalty? What happens with trying to source a replacement?? Will he get a special allocation for another GT3 touring? Or is it back to the bottom of the list? How does it work with Porsche?